Both Asgard 12.6 and 19.6 can be upgraded by adding the Asgard High Wall available as accessory in two sizes. It is easily attached to the tent by simply zipping the High Wall to the bottom of the tent – and you can also attach the zip-in groundsheet, if you have one. The High Wall comes with 3 extra pole segments for extending both the center pole and the two legs of the A-pole by the entrance. 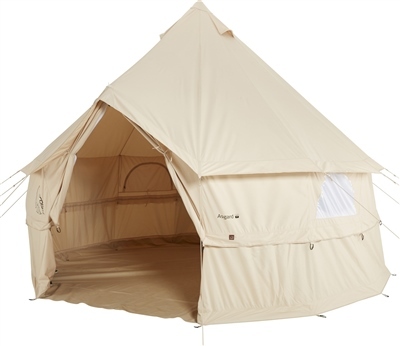 The Asgard High Wall offers much more headroom making it possible to stand up in most positions inside the tent – but you can also leave in the extra poles and pull up the sides turning your Asgard into a tall tarp or parasol.